As every year, in 2017 the student's committees will be voted, too. The unit for public relations (part of general student's commission) has created a special website with considerably explanations, e.g. why you should take part in university elections and which kind of student's committees you can vote for – except the student's parliament and the general student's commission. We recommend to visit that page wamly to you. In the following, we specified our main concerns. We would be very glad if you accord with our positions. Gladly you may visit us on our weekly plenum or contact us via mail. The SDS of Marburg is a socialist and plural student association, which is independent and democratically based. We campaign especially within collaborations of interested people and other democratic groups as well as in a solidary and critical relation to the party DIE LINKE for the concerns and interests of the students, like social justice and a better educational system. In doing so we attempt to develop an emancipatory policy founded on feminist, Marxist, anti-capitalist and anti-oppression positions. The commitment for a stronger emancipation of minorities and disadvantaged groups of persons as well as the fight against fascism is thereby especially important to us. The perception of collegiate interests on so many different levels, for example the Student Parliament (Stupa), different departments of the General Student Committee (AstA), the Council of Elders or on urban policy level, as well as their sustainable and public-oriented articulation and enforcement form the core component of our work. Written by AG Feminismus des SDS Marburg. We see ourselves as a feminist group, which is vary aware, that the path of elaborately dealing with gender equity, gender variety and sexism is just trodd/en upon. Therefore it is especially a matter of fighting and displaying those discriminations both as a social structure and as a phenomenon in our political action. Written by AG KriWi des SDS Marburg. The approach - being free from value judgments as guarantor for objec- tivity - applies*to both natural scientific and socio-scientific findings. In such descriptively aligned studies the theoretical cementation of the power and rule systems is inevitable. More housing space for students! Written by AG Soziales des SDS Marburg. The city and the University of Marburg are proud that the number of students is steadily increasing. We are glad about that, too, since everyone has the right to education. However, it is problematic when the city and the state do not do justice to the changes that come with it and fail to provide affordable housing space for all students. Those who have to stay at an emergency accommodation at the beginning of the semester will most likely move to the outskirts of the city or have to take an overpriced apartment. Written by AG Verkehr des SDS Marburg. The Marburger Semesterticket with its enormous scope inclusive the using of the IC-Train and the bicycle rental-system “Call a Bike” ensures mobility at any time in Marburg and beyond for all students. SDS.dielinke Marburg wants to preserve the Semesterticket, based on the students’ need, in its present extent and seeks to expand the bicycle rental-system. We see the Semesterticket as an important achievement that not only benefits all students but also makes environmental friendly transport like bus, train or bicycle more attractive than motorized individual transport. Antifascism is more than just theory! Written by AG Antifa des SDS Marburg. Antifascism was and always will be a necessity. Especially when people fleeing from war, suffering and poverty are made to be the problem themselves and are seen as “crisis” in a societal consensus it is also our task as students to make a stand against the political shift to the right. The AfD enters parliaments meanwhile CDU, SPD and Co. are deporting large quantities of people, some of them into their safe death. In the year 2016 more than 900 attacks on refugee’s homes occurred. 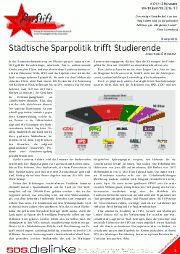 At more than 40 universities throughout Germany, the SDS is active in university politics. We all work for a fundamental social transformation of the university and the society. Furthermore, we are active in several alliances such as the Anti-Höcke-Bündnis, International Women’s Day and many more. Additionally, we are represented in the Kurdistan-solidarity-plenum and participate in campaigns against right-wing politics in the federal state of Hesse and Germany. We also support refugees and we are involved in the Blockupy-protests – just to name a few. University politics concern you too! Written by Ag Hochschulpolitik des SDS Marburg.